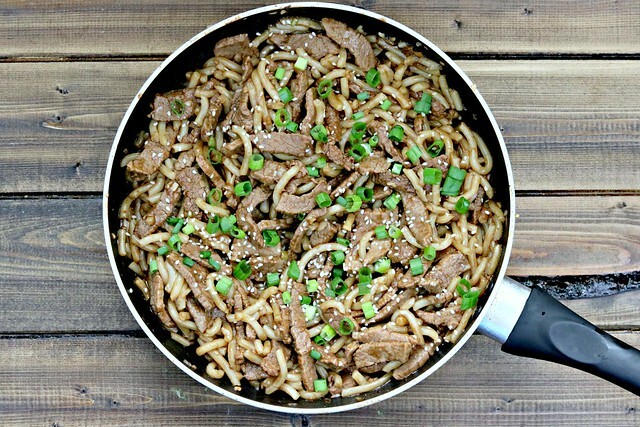 Garlic beef and noodles makes a great weeknight stir-fry dish, quick and easy to prepare and full of flavor! Happy hump day, friends!! I hope you all had a wonderful Memorial Day weekend, remembering all those who have given their lives so selflessly so that we may all enjoy the freedom we have. It was pretty much business as usual for us, other than having an extra day off. We did get a new grill (dual side gas and charcoal!) and made some delicious venison bacon burgers. So, there was that. I know this time of year is hectic for many who have school-age children, are college students, or teachers as end-of-year testing, graduation, etc. are in full swing and summer vacations are beginning. Oh, and sports, right? Little kid sports, like baseball have been going on for awhile now, and that’s wrapping up as well. Or so Facebook tells me. All of these things, combined with regular, everyday life, mean evenings and weekends are likely even more hectic than usual. Right? And the last thing mom or dad has time to do is spend a lot of time in the kitchen making dinner. And that’s where meals like this one here come in verrrrry handy. I mean, let’s be honest – I don’t have any of the above scenarios going on in my life right now, but with a 9-month-old and getting home from work and daycare after 5:30 I don’t have time for a lot of kitchen-standing, either. Fortunately J takes the reigns when he gets home from work and plays with her and feeds her dinner while I’m cooking, then maybe we eat really quick before her bath time and putting her to bed. Sometimes dinner just isn’t ready quick enough, so we don’t eat until after she’s in bed. At 8 o’clock. Which is a terrible time to eat dinner, really. But, as she getting older, it’s a little easier to manage. Last night I even got dinner done in time that we all ate at the same time – which doesn’t happen all that often during the week! But when there is stir-fry of any kind on the menu, the prep and cook time are usually minimal and if I get my booty in gear right when I get home, I can make it happen. 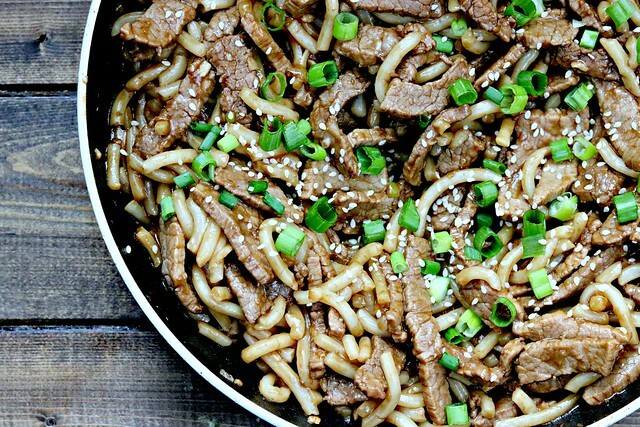 And this meal…this garlic beef and noodles – was freaking delicious. Baby girl even had some bites and loved it. But she pretty much loves any food, so there’s that. I’d never cooked Udon noodles before this. Heck, I had to circle the International food aisle a couple of times to even find them! But I’m glad I decided to try them, because they really were perfect in this dish. Of course if you can’t find them or just don’t want to use them, you can use any long pasta of your choice. I love all kinds of Asian flavors and sauces, but I love how simple this one is, yet it’s full of flavor. Three ingredients for the sauce. Seriously. Oh, oh! And if you wanted to give it a little spice, you could always squirt a little sriracha in the bowl when you are mixing it up. Because, sriracha rocks and makes everything better. So, whether you are planning for a graduation this week (they start tonight for high schools in our area), are running your kids around to this practice or that, or if you just had a long day and don’t want to be on your feet in the kitchen for long, then THIS is the meal for you. Heat oil over high heat in a large skillet. Add beef strips and sear for 2-3 minutes, then turn and sear until browned and almost cooked through. Add the garlic and ginger and cook for 1 minute, until fragrant. Pour in the soy sauce mixture and bring to a simmer. Cook for 3-5 minutes until sauce thickens slightly. Add the cooked noodles and stir to coat in the sauce. 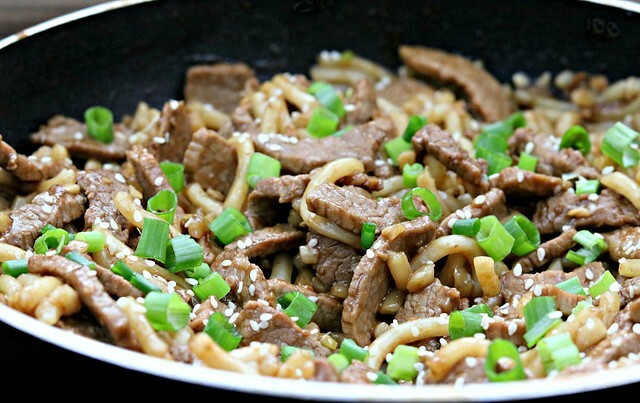 Remove for heat, top with green onions and sesame seeds, and serve!